Spot-on, Miss Barbette. Well done. When I saw the commercial, I felt the same as did you – which, by the way, you expressed eloquently in this blog. As to question of whether or not it would have made a difference had the song been sung in English, – accents and all – I highly doubt it. I think the commercial was a stroke of marketing genius, much like their ad from 1971. What better message to send, than one about a free, and inclusive USA? Sadly, there is a willingly unenlightened faction within the citizenry of the USA that has, of late, been out-shouting the voice of reason and civility. 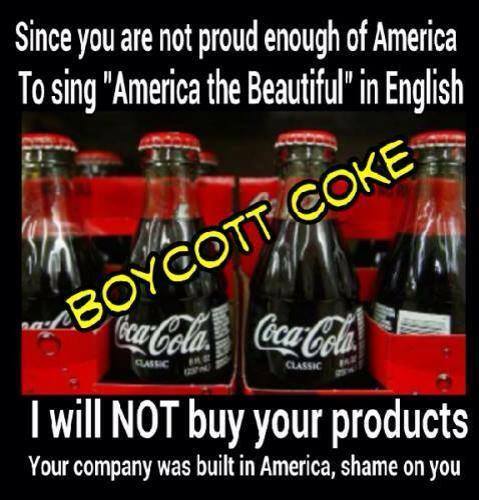 Rather than boycott Coca-Cola for mounting a well-executed marketing campaign, we should boycott deliberate ignorance, intolerance and authoritarianism – that’s my opinion.